CULLMAN – Below is a list of Christmas events for you to enjoy this weekend, beginning Friday morning at 9 a.m. For more details, visit www.CullmanTribune.com/calendar. Friday, Dec. 1: 9 a.m.-6 p.m.
Saturday, Dec. 2: 9 a.m.-3 p.m. 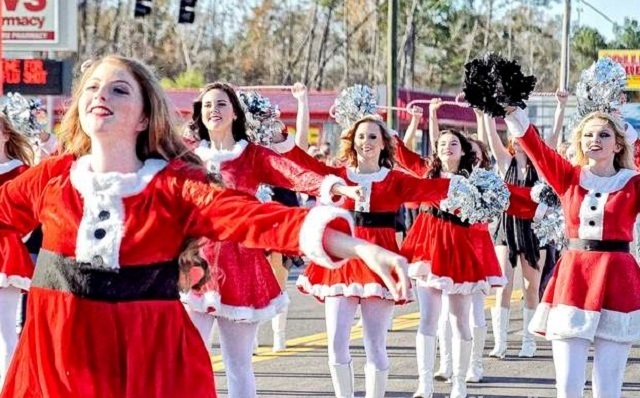 The annual Christmas in Cullman Downtown Parade will begin at 6 p.m. and will run from Busy Bee Café to Depot Park along First Avenue in downtown Cullman. After the parade, the festival will take place in Depot Park, highlighted by the official Cullman Christmas Tree Lighting Ceremony. The festival will include a petting zoo, inflatables, and free games and activities for kids. Live music, including bands and choir groups, will be performing at Depot Park for the event. Christmas in Cullman is about to get EPIC … again! The EPIC (Emerging Professionals Impacting Cullman) Christmas Sweater Party is set to rock Rumors Deli Inc. on Friday, Dec. 1 from 6-11 p.m. Drop by at any time or stay all evening for food, drinks, prizes, a Christmas sweater contest and so much more! Though this festive event is hosted by Cullman Chamber's young professionals group, anyone 21 and up is welcome! Pre-registration is not required, but it would greatly help for a food count. Contact the Chamber at 256-734-0454 or info@cullmanchamber.org to sign up today. Santa Claus at Dodge City Park, 6-8 p.m.
Santa Claus will be at Dodge City Park Friday and Saturday nights from Dec. 1-22, from 6-8 p.m.
Bring the kids by for hot chocolate and cookies with Santa, while enjoying the lights. The 15th annual Winter Wonderland Christmas Light Display at Sportsman Lake Park will take place from Dec. 1-31*. The display will be closed Dec. 4-5 and Dec. 11-12; Wednesday and Thursdays, open from 5-9 p.m.; Fridays and Saturdays, open from 5-10 p.m.; Sundays, open from 5-9 p.m. The Fairview Lions Club Christmas Parade will be Saturday, Dec. 2 beginning at 4:30 p.m. on Wesley Avenue in Fairview. Parade participants will line up at the turnaround by the school no later than 4 p.m. The parade will end at Randall Shedd Community Park, where there will be the reading of the Christmas story, free hot chocolate and cookies, and Santa. Anyone who wants to participate in the parade is welcome to join in. Breakfast with Santa!! Cost is $5 per person. All proceeds benefit our Angel Tree children. Includes breakfast and photos. On Saturday, Dec. 2, the Hanceville Civitan Club will host the 28th annual Cullman County Christmas Parade on Highway 31 in Hanceville, followed by an open house at Hanceville Fire Station One. This year's parade will honor the memory of Joann Walls, who passed away earlier this year. The 2-mile parade will start at Wallace State and end at the fire department, where there will be an open house with concessions. For those who want to participate in the parade itself, applications will be taken until Friday, Dec. 1. Participants are asked to pay $5. For more information, contact Hanceville City Hall or call Ricky Cason at 256-201-7040. Copyright 2017 Humble Roots, LLC. All Rights Reserved. Image: Tribune file photo 2015.